You may be a hunter, or just remember shooting archery as a kid. A 3D Shoot is like a round of golf. Each target is in the shape of an animal with a circular pattern on the side. You get points for hitting as close to the center of the pattern as you can. Distances change from target to target and the walk around the course is exactly 1 mile this year. A great walk, enhanced by archery practice, competition with friends and family and being out away from the cell phone and computer for couple hours. No pressure. No one to prove yourself to. Bring your bow and a quiver of field point arrows. Long bow, re-curve, compound and even crossbow. Kids are welcome, and under 16 shoot for free. Kiddie arrows have a little trouble sticking into the targets, but just tell them that hitting it is the idea. 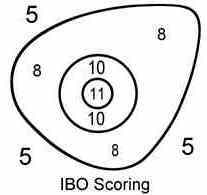 We use a IBO standard targets by Rinehart.com. A perfect round at Frontier Archery would score around 440. 3D archery is a subset of field archery focusing on shooting at life-size models of game and is popular with hunters. It is most common to see unmarked distances in 3D archery, as the goal is to accurately recreate a hunting environment for competition. In the past 10 years 3D archery has taken new light with a competitive edge. There is a whole new group of competitions that are no longer considered hunting practice. Competitions are held in many U.S. states with the totals from each state being added together to crown a single winner within each division. Some competitors will travel thousands of miles a year to compete to try and claim the world title in 3D archery. This competitive style has been growing in many other countries and should continue with strong support for many years to come. The major 3d archery groups are the IBO (International Bowhunting Organization) and the ASA (American Shooters Association) are primarily based in Eastern United States. They each have different rules and scoring methods. They host a number of competitive shoots across the Eastern United States. There are several classes in each organization that range from hunter all the way up to professional classes. Each class shoots at maximum yardages that vary by class.